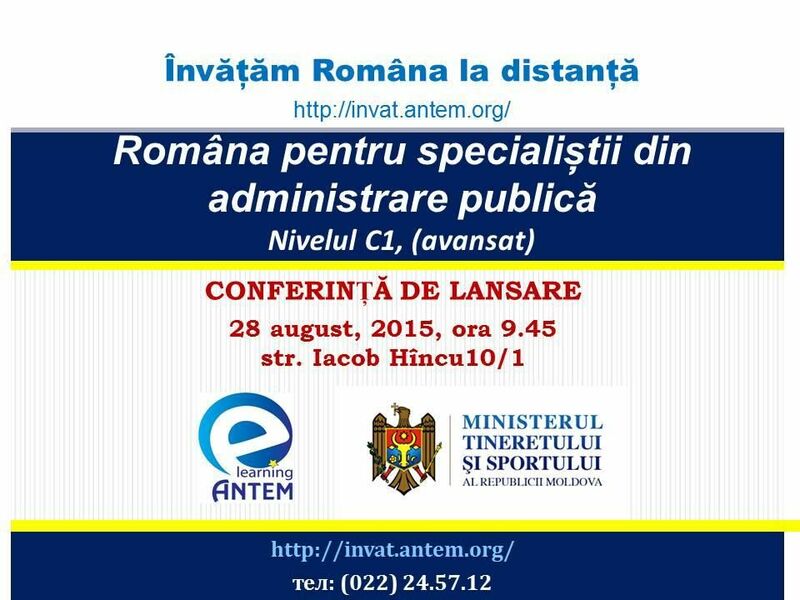 A launching conference of C1 level of Romanian language learning for professionals in the public sector will be held on Friday, August 28th by the National Association of European Trainers from Moldova, starting at 9:45, in the conference Hall on the second floor, Building IDIS ”Viitorul” . C1 level of Romanian Language knowledge means an advanced level, and it will be taught by e-learning method in the framework of the Program “Distance Romanian Learning”, implemented by ANTEM, with the financial support of the Ministry of Youth and Sports. The courses will be held for 30 minority members, separated into two groups, starting from September 1st. At the moment, approximately 1200 people, enrolled for A1-A2, B1 and B2 levels, can benefit of free courses within the program “Distance Romanian Learning. ANTEM is the only organization in our country performing language teacher training programs for the public sector. Founded in 2005, ANTEM has become an active promoter of the official language learning by minorities, professional, competent and responsible attitude towards national minorities’ integration through cultivating communicative skills. ANTEM persevere in opening dialogue and intercultural and interethnic communication by offering state language teaching services to different categories of beneficiaries.